If you tuned into The Profit on CNBC this week, Marcus Lemonis was taking a look at mobile gelato company HipPOP, that was struggling to expand into franchising the business. All throughout the episode there were a bunch of glimpses at the HipPOP’s food truck wrap and the company's vehicle fleet branding. While the commitment level of the company’s owner wasn’t so hot, their use of vehicle branding was a cool as can be. A food truck might be the single most important vehicle that can be wrapped. Service contractors who have their fleet vehicles branded are making hundreds of impressions everywhere they go, typically with a commercial storefront to boot - but a food truck is often the only point-of-impression that their owners have. Because of this fact, the wrap design for a food trucks is not something to be taken lightly. 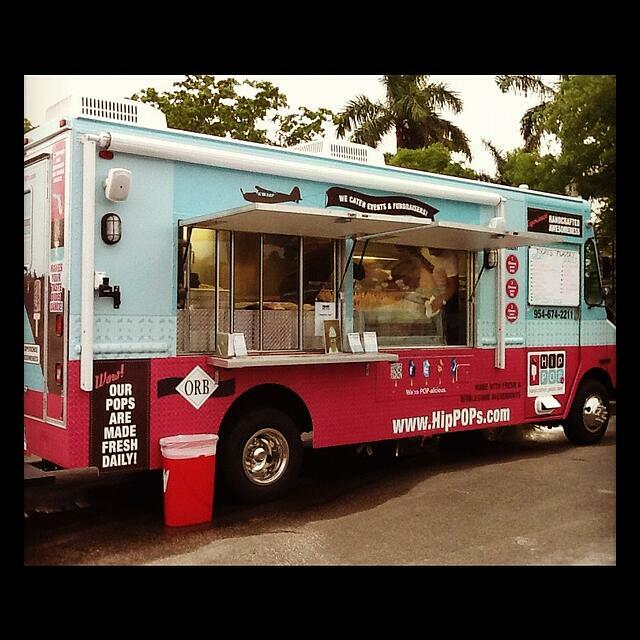 HipPOP’s food truck branding is bright and eye-catching, important qualities for any mobile business. Besides the high resolution gelato pops images on the side, all the graphics are flat vector graphics, which gives the truck a clean, modern look. The retro color scheme’s softer colors help bring personality to the truck, and fit well for southern Florida, where the truck is based. A good food truck design also needs to have balance when it comes to presenting information about the business. Too much, and your customers won't be able to focus and will miss out on the important pieces. Too little, and your not taking advantage of the great visual real estate that a food truck can offer. The HipPOP truck handles this design balance well. They display important business information: phone numbers, website, social media channels, catering services, while including a few other educational pieces like sourcing locally and having their products made fresh daily. ...and create memorable branding that won't soon be forgotten! Another thing we noticed in this Profit episode was a second delivery / catering vehicle in HipPOP’s warehouse parking lot. The small city van wasn’t fully wrapped, but still had the company’s logo and basic information on it. While not as strong an impression as having full or partial graphics, the logo and other branding on the vehicle helped tie in the fleet and build impressions for HipPOP whenever it was seen. Another important part of branding (both for vehicles and businesses) is keeping a continuity between your vehicle graphics and the rest of your promotional material. Throughout the episode you would see various marketing materials and employee clothing using the same brand colors, logos, and elements found in the wrap. Like their catering vehicle we mentioned above, every consistent impression a business can make helps them build a strong foundation in their customer's mind. At the end of the episode Marcus Lemonis and HipPOP weren't able to work out a deal. While their disagreements between management styles couldn't be reconciled, we've got no doubt that HipPOP's food truck and mobile branding will help them stand out and continue to find success! Check out the link below to learn more about food truck branding and how wraps can help your mobile business get noticed!